For most of my life, Veterans Day was pretty much just a day on the calendar. Yes, my dad served in Patton’s army, but that seemed like an incidental fact from the past. 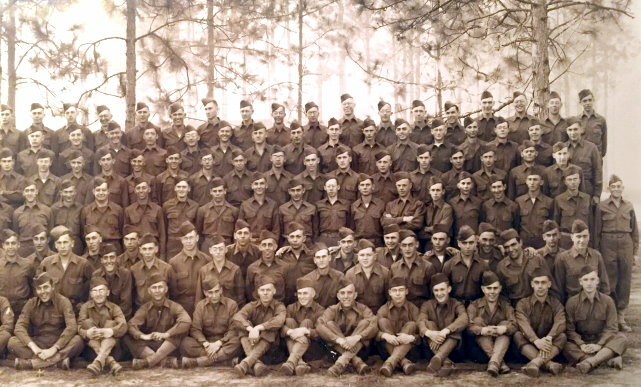 Being a modest member of the Greatest Generation, dad rarely spoke about the war. In the fall of 2000, my sister and I took our parents up to Grand Marais. Dad had been going downhill as his Parkinson’s disease progressed. Revisiting the site of many happy family vacations, however, really rejuvenated dad. He spent time skipping stones on the shore and ate with more enthusiasm than we’d seen in years. In December, dad fell and lost his ability to walk. While in rehab, we hoped dad would get better and return home. But he quickly went downhill. Buying presents that year was a challenge. When we bought his favorite weather calendar, we wondered how long he’d use it. 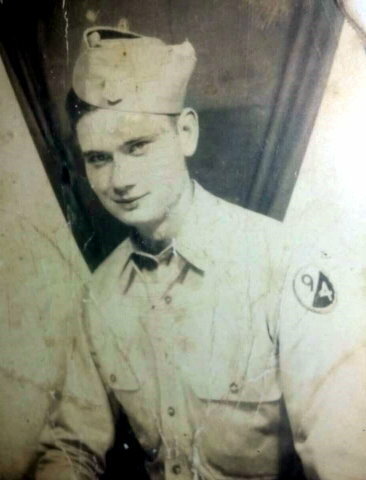 It had been more than 55 years since dad had served in the 94th Infantry Division. Yet there we were at a military ceremony honoring my father. They never forget their own. Soon after the funeral, we found a box containing a Bronze Star and two other medals tucked beneath underwear in dad’s top bureau drawer. We also found four five-year diaries that he kept from 1941 to 1960. How ironic that dad managed daily entries during the war, but sporadic entries after Lori and I were born. Were we more challenging and time-consuming than helping to save Europe? Intense enemy fire. Indomitable courage. These were not words I associated with dad. He was a quiet guy who was devoted to his family, took us on great vacations and loved to garden. But moving with indomitable courage through enemy lines? In the past, when we had asked about his war days, dad only told us about the lighter moments like spending time with the beautiful Olga and her baroness aunt and dining at their villa in Czechoslovakia. I’d always envisioned dad serving alongside Goldie Hawn in Private Benjamin’s army. I never imagined him actually on the battlefield, facing enemy fire. I was sad I couldn’t tell him how proud I was. Veterans Day is no longer just a day on the calendar for me. Last week, and throughout the year, I take time to reflect and honor the brave men and women who have risked everything in service of a nation that is not always grateful enough. FORT LEE, Va. - Preserving a legacy can make the difference in whether or not people remember you after you’re gone. This was the intention of the 94th Infantry Division Historical Society transferring their flag to the 94th Training Division in an event held here at the Gerow Center on Nov. 21, 2016. Col. John Aarsen, assistant division commander of the 94th Training Division, explained that traditions and heritage are keys to the success of carrying on the society’s legacy. “I think it helps us by strengthening our understanding of our past,” Aarsen said about receiving the society’s colors. 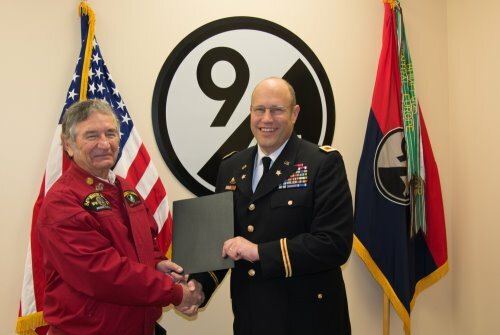 Those who had passed the colors to Aarsen at the event were the 94th IDHS Immediate Past President Bill Van Sant, its Secretary John Clyburn, and Mr. Vivek Kshetrapal, chief executive officer of the 94th Training Division. Formerly a member of the Army Security Agency from 1961 through 1963, Clyburn currently serves as the society’s reunion coordinator, as well as its secretary. He explained that at this year’s reunion, the notion came about that it would be “a great idea to hand over the reins to the current 94th Training Division.” Aarsen wholeheartedly agreed with him. Another important piece of the 94th’s history is tied into their new training center that is currently being built here. Clyburn explained they are working on getting the center dedicated in honor of the 94th Infantry Division’s Medal of Honor recipient Master Sgt. Nicholas Oresko. He was the last MOH soldier of the 94th who died three years ago. Looking at the big picture brings a bleak reality of the small number of 94th WWII veterans remaining. Approximately 20,000 soldiers from the 94th fought in the war. Today, about 200 of them are still alive. That’s only one percent of the original number from WWII. Aarsen took a moment to reflect on the flag transfer’s historical significance. The flag at the Veterans Center will fly this week in honor of World War II veteran Anthony Santos Rao (July 31, 1925-Nov. 18, 2012). He joined the U.S. Army on Oct. 29, 1943, and served as combat infantryman with 94th Infantry Division 3rd Army, 376th Regiment, Company E 2nd Platoon. He served in Northern France, Rhineland, Ardennes-Alsace and Central Europe, and served during the Battle of the Bulge. He was discharged on Oct. 27, 1945. Sgt. Rao was awarded the Silver Star Medal (for saving a wounded comrade’s life and the actions it took to do so); the Bronze Star Medal with V (valor) device; the Purple Heart Medal (for wounds received in action); the European African Middle Eastern Theatre Ribbon with four Bronze Stars; the Combat Infantry Badge; the Good Conduct Medal; and the World War II Victory Medal. Rao also received a citation from the French government for participation in the invasion of Normandy. On July 23, 2010, the French Legion of Honor Medal was awarded to Tony in a ceremony at Gloucester’s World War II Memorial. A representative of the French Consulate in Boston presented the medal, which recognized his service with the U.S. Army stationed in France in 1944, after the Normandy invasion. The award named him a “Chevalier” in the Legion of Honor. The flag was requested to fly in his honor by his daughter Marie Giambanco of Gloucester. Anyone wishing to fly a flag in honor of a deceased veteran may call the Office of Veterans’ Services at 978-281-9740.
my name is Lothar Kruft. I was Burgermeister (chief of administration) for 18 years of the community of Gersheim/Saarland. I am searching for pictures - fotos of the time December 1944 until March 1945. It is the region saarpfalzkreis and our main river is the Blies. Perhaps you can help me? Viele Grüße aus dem Bliestal! My father in law was an infantryman with the 94th in WW2. I am trying to locate any veteran that knew William R, Walton. He was known as "Bill" or "Red". Bill was injured by shrapnel, but due to their medic having gone AWOL, his award of the Purple Heart wasn't processed. I am looking for any WW2 veteran that will sign a statement that verifies his injuries so that I can get his purple heart awarded. The day before his death, he said he was no longer a cook, but had been designated a runner for the 3rd platoon. I know from Bill Foley and some of the documents I have read, some of the 3rd platoon was in Kemmlerhof. We are trying to see if any of The soldiers that were captured there might have known him or remember anything. I am looking for information on Paul R Haggard, from Tennessee. He was with the 94th, G company of the 302 regiment, he was a tec4, killed at Lampaden, March 6th, 1945. I'm looking for information about what company he was in and where he might have been during the battle. Also, any pictures and docs, as everything was destroyed in the fires at the archives. first sorry for my english. I am searching for information about the 94th infantry division or parts of the division who captured the german town Idar-Oberstein. It would be very interesting for further investigations which unit are involved. Does anyone know where my father, technical sergeant Ames Harrington fought in World War II after his release from the POW camp in November 1944? I search about 94th signal bataillon at barneville Carteret in normandy in autumn 1944. Specially on leutnant Bisset kia 16 nov 44 or his comrades. 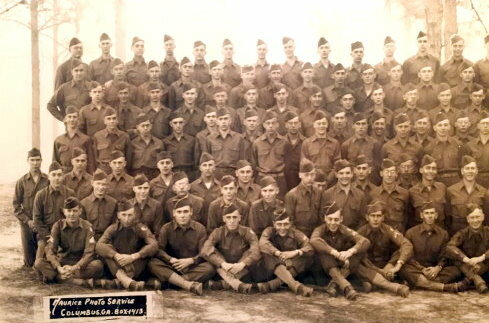 My grandfather was PFC Allan Coy Campbell who served in 2nd Battalion, 301st Infantry Regiment. I don't know what company he was in. He died two years ago and I am trying to find out about his service. According to his discharge paperwork he was a medic. I don't know if he had a nickname or which name he went by in the war but growing up, people always called him Coy. I'm wondering if anyone would have known him or had heard of him from a relative? Any help or information would be greatly appreciated. Attached is a photo from his service days. My name is Tim Archer. 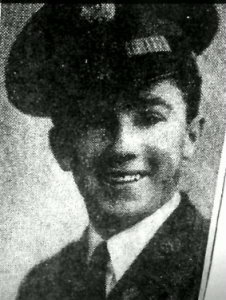 My Father, Norman Archer was in the 94th during the war. I found his name and hometown, Odon Illinois on your roster but I'd really like to know more about his specific unit and his history with it. I am trying to find a relative of Luke Martin. He was in the 94th Infantry. 356 Field Artillery BN, C Battery. 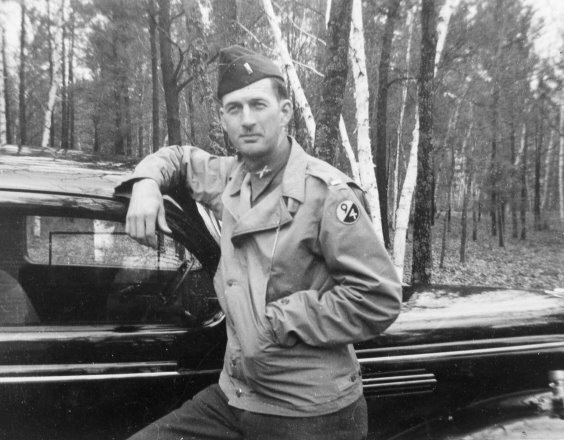 I have a picture of Luke Martin which my husband had taken when they we together in Germany, April 1945. If you find a relative, please send me their address so I can mail this picture to them. My husband, Dr. Carl J Schaefer was in the 356th Field Artillery Bn, Battery . He was a FO and RO (1st Lt. Schaefer). My e-mail is --- joannschaefer27@gmail.com. Thanks! my name is Christian Backes, I'm from Germany and I'm writing to you because I just found your site about the battle of Orscholz (or Orsholz, how it is sometimes faulty named even in the original documents). I'm 33 years old and I am interested in your site because I grew up in that area, my Grandparents living in Orscholz. I grew up seeing the remains of the tank-stopping concrete line aka. dragons teeth. Being the 3rd Generation after the war, these remains and storys kind of make it hard to imagine that this now peaceful area (which now also is a spa town) once had been a place of the horror of war. I´d like to ask if you have any pictures of these events, because I'd like to match these to today's scenery. I'm especially interested in photos of Orscholz and Buschdorf, because these are the villages I grew up in (http://www.94thinfdiv.com/94BattleBulgeL.html). Hello, I'm looking for information on my Great-Uncle Pvt Irving S Clements. He was killed in action on March 4, 1945. He was in 301 INF. If anyone has any information as to where the 301 would have been on that date (The best I can tell is near Lampaden), that would be much appreciated. The family "story" is that he was laying covering fire during a rescue attempt for a captured soldier and an enemy sniper took him out. Hello, I am still looking for information about the 94th Division's helping Jewish girls who survived the Volary Death March in May 1945. (More Information on the Volary Death March). Later that summer the 94th helped supervise these very sick young women. Among those I am trying to obtain information about are the quartermaster, Tony Dizzoni, of Chicago, my father Samuel Gladstone and his Sgt. George Gibian, another quartermaster corps member, Ray Stabinsky. Also, does anyone recall shooting up a car in a field in Volary said to have been owned by Goering? Any assistance would be appreciated. My great uncle John Sawka served in the 94th 301st and was a medic. He was KIA in feb of 1945 and I would like to know if anyone has any information about him, whether they knew of him or served with him. I am interested in any information you may have on Irving M Rudowitz KIA. I believe I may have been named after him but have no sources left who can advise me or give me information on him. Thanks Irving Rudowitz. Subject: My Grandfather was William Perry Howie 94th Signal Corp.
My Grandfather was William Perry Howie. He was with the 94th Signal Corp. He served in D Day through the end of WWII. He was in Bastogne during the "Bulge." He told me that he had been mistaken as Humphrey Bogart on occasion. Does anyone remember any stories of my Grandfather? He told me that he had a friend that he called "Callipy" (I'm guessing at the spelling). He spoke of many practical jokes. He also told us that his group entered an abandoned farm house with the dining room table full of freshly prepared food. Although he knew that the food was probably poisoned, he ate anyway saying that if he was to die it would be on a full stomach. He laughed and told me that by the time that everyone realized that the food wasn't poisoned, he had eaten most of the good stuff. Has anyone heard any of these? I would like to write a book and could use some help. I had a uncle with the 94th , name was Nicholas Fast Horse. Any information would be greatly helped. 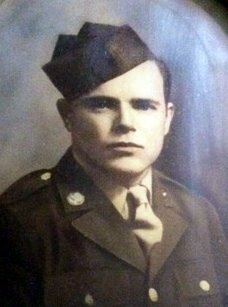 I am looking for information of my uncle Edward "Bill" Lytle. He was with co. B, 302nd Inf Regt, 94th inf division and died in France on March 2, 1945. He was from Jacksonville Fl and was at camp Blanding. 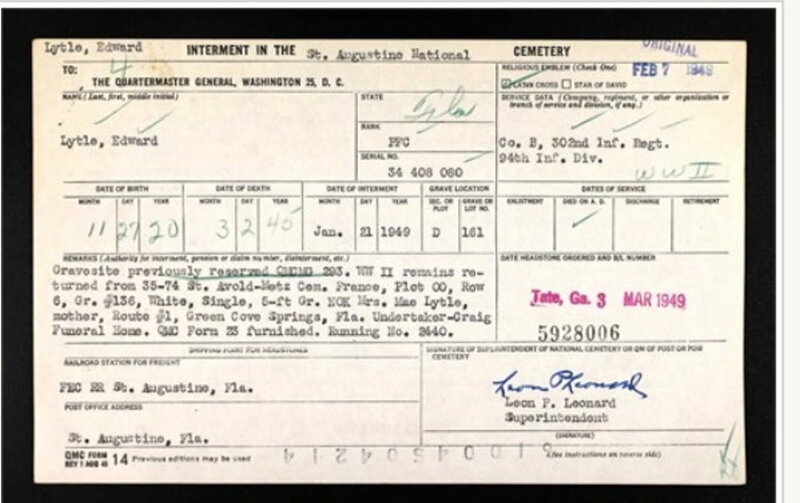 Attached is the form from when they moved his body from a cemetery in France to St Augustine National Cemetery in FL. My email is deblmwdeblmw@yahoo.com. Thanks for any info and thank you for serving our great country. I am seeking information on my dad, Tom Everson, and on his company and regiment. In particular, I would like to make contact with the family of Bill Barlow, whom my dad served with. I would also like to make contact with the family of Carl E. Jennings, Sr.
Hello. My brother and I are looking for any info anyone may have regarding my father's service in Company K, 376th Infantry Regiment, 94th Infantry Division. His name was William Pitts and he was in Europe as late as December 1945. Any info would be welcome since he never spoke much about thr war. 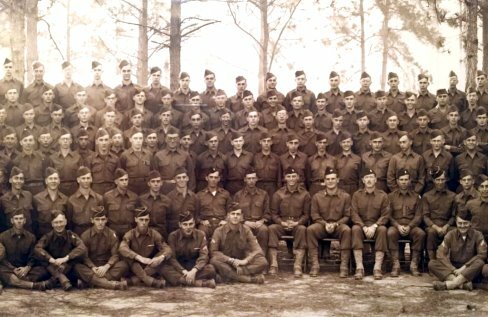 Can anyone identify any of these recruits in the ASTP program Boot Camp photo from Fort Benning, Georgia During WWII. For the past couple of months I have been sending out letters to company members who supposedly served in WWII with my father, Charles Everett Weeks. The only information I have on my father and his service during WWII is information from his honorable discharge paper. Information from the discharge paper says that he served in Co "K" 302 Infantry. It also says that he was a First Sergeant and served in Rhineland and Central Europe. He was inducted into the service on October 30, 1942 and separated in February 7, 1946. Reason and Authority for Separation: AR 615-365 CONVN OF GOVT RR1-1 (Demobilization). Since I have been sending letters out to his company members who are still alive, I have received several letters written back to me by various members who served in Co "K" saying that they do not remember my father at all. Some even state reasons for they're not remembering him as being the fact that he could have possibly been moved out of Co "K" before going over to Europe to fight, etc. So I assume this could be possible, that he was moved to another unit or company during the war, but at this point, if this was indeed the case, I have NO clue as to how to find out what company he was moved to, if in fact he ever was. I would really appreciate some direction from someone as to where to continue my search from here. All I have to go on is his discharge paper information. I have no pictures of him at all during the war, nor do I have letters that he wrote to anyone back home during the war, or any other information that could give me clues. I feel like SOMEONE somewhere out there should remember my father, especially since he had such a high rank as First Sergeant, but so far I'm coming up with nothing. If anyone reading this remembers my father, OR has any suggestions of where else I might search to find out information on him, please contact me at the following email address: donnaduty1@gmail.com. Or you may write to me at the following address: Mrs. Donna Duty, 110 Angora Court, Cary, North Carolina 27513. My father died in 1993, and we rarely talked about the war, but he did tell me one time that he loved being over in Europe during the war and wished that he could have lived there. I'm very, VERY proud of him and that he got to the rank of First Sergeant, and I am desperately wanting to know more about him and his time served during the war, and especially to correspond with anyone who may remember him. I'm writing in hopes of finding some information on my grandfather. Base d on stories my mother told me, he served in the Battle of the Bulge and helped liberate a concentration camp or POW camp. He died before I was born. I thought he may have been part of the 90th Division but he was not after contacting them to see if that was true. They said they got a hold of his personnel file and told me he served with the 94th in the 302 Regiment. I'm writing to see if you can give me more info on this great Division and what battles or campaigns my grandfather may have been apart of. His name was Donato H. Pena, his service number was 38 364 830 and he was from South Texas. Any info would be great help as I tell my children what their great grandfather did for the US in WWII. I'm very anxious to learn what he would've done in the Battle of the Bulge and what camp he may have helped liberate. The men were outside Metz, France, all lined up in alphabetical order. Captain Dahl wanted four volunteers for the Weapons Platoon. There was three Mortar Sections in the Weapons Platoon and three Machine Gun Sections in the Weapon Platoon. The three guys that were lined up beside Bill Graves also stepped out. Graves, Gillard, Goff, and Gibson were the four G's. The Captain said to go with Sargeant Herdwick and he will assign you to your job. He assigned two of them to the Mortar Section and two of them to the Machine Gun Section. Graves was in the Mortar Section headed by Jerry Jende. When Herdwich was made Platoon Leader, Jende was made Platoon Sargeant, and Godfrey was Section Sargeant. Jerry Paskiewicz was Squad Leader of one of the Mortar Sections. The only one that was wounded bad enough to be evacuated was Gibson. He was hit in the back with a strapner from an artillery shell. Bill dived in the hole first and Gibson jumped in the hole on top of Graves. Unfortunately, Gibson got hit. Medic said he thought he would be alright. I wanted to see if anyone remembers serving with my late Father Robert McMillan. He went into the Army circa April 1942 and was discharged in November of 1945. He entered as a Private and left as a First Sargent.